Moscow will not recognize the conclusions on the Skripal case until Russian experts receive access to the OPCW materials and the injured parties, according to the Russian Envoy to the OPCW. The Russian Envoy to the OPCW has stated that London cannot provide real evidence of its version of the Skripal case. The OPCW report on the Salisbury case is "questionable," the final conclusions can be made only after receiving the chemical and spectral analysis of the samples, Russian Envoy to the OPCW Alexander Shulgin said. "The UK demonstrates a clear reluctance to cooperate fully in the investigation of this whole muddled history. This convinces us that the British do not want any truth. They cannot be allowed to swim out," Shulgin emphasized. The British do not want the truth in the case of the Salisbury poisoning, the Russian permanent representative to the OPCW stated. "The report on the conclusions of the British experts presented by the Technical Secretariat raises a number of questions and requires additionally detailed elaboration, including from the British side," he noted. Shulgin emphasized that Russia has answered all the UK’s questions on the Salisbury incident. 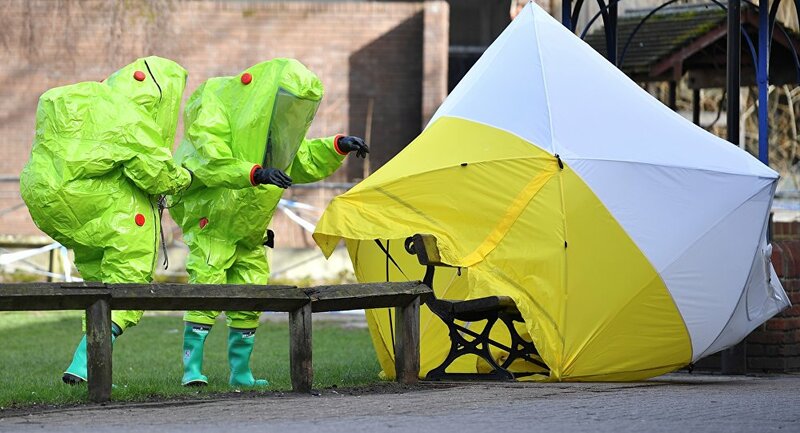 "Despite the inexcusable nature of this ultimatum, we did not ignore it at all but immediately gave an unambiguous answer, 'Russia has nothing to do with the nerve agent in Salisbury’, and the UK has not contacted us with any other questions," the Russian envoy to the OPCW stated. The British side suggested that we confess to one of the two invented versions: either the poisoning of Sergei and Yulia Skripal was a deliberate act of Russia, or that Russia lost control over the allegedly available arsenals of poisonous substances, Shulgin noted. "We know very well that the 'Novichok'-type nerve agents were in production in a number of countries… Thus, on December 1, 2015, the United States Patent and Trademark Office contacted the Russian agency responsible for issues concerning patents with a request to check the patentability of an invention made by an American scientist T. Rubin," Alexander Shulgin said showing a document to the OPCW. According to the envoy, the document concerns "the invention of a special bullet" that could be equipped with different kinds of toxic agents, including tabun, sarin, soman, cyclosarin and Novichok among others. "In other words, this document confirms that in the United States the 'Novichok'-type nerve agents were not just produced but also patented as a chemical weapon. And not some long time ago, but just a couple of years ago – the patent is dated December 1, 2015," the diplomat said. On April 12, the OPCW presented a report to the members of the organization on the findings of the Salisbury incident's investigation. According to the information obtained, the OPCW has affirmed London's conclusions about the nature of the toxic substance that the Skripals were poisoned with. At the same time, the details of the report have not been disclosed, since it is available only to representatives of OPCW member countries. In March, former Russian agent Sergei Skripal and his daughter Yulia were found unconscious on a bench at a shopping center in the UK city of Salisbury. The UK has accused Moscow of organizing the attack with what UK experts claimed was the A-234 nerve agent. Russia has refuted having any role in the poisoning, pointing to the lack of evidence provided by London to substantiate its accusations.